How does HUB Connect integrate with BambooHR? SwipeClock® integrates with BambooHR through our API. Employee information from within BambooHR is pushed to SwipeClock® so the two systems stay in sync. Please note that this integration is not designed to send information out of SwipeClock and into BambooHR, so BambooHR will need to be the primary system of record. Using the BambooHR’s intuitive dashboard you can connect your clients to TimeWorksPlus in a few clicks of the mouse. When your clients use Time & Attendance integrated with Payroll their retention increases. How do I Enable the BambooHR Integration? IMPORTANT: This feature is currently in beta and not available to all users. Please check back for updates on this feature’s availability. If you want to add the BambooHR integration and you have existing employee data in TimeWorksPlus, please read Integrating BambooHR with an Active TimeWorksPlus Account before implementation. If you have additional questions, contact your timekeeping provider. Look for the Integration Management menu item. If you see it, click the link and look for BambooHR Integration options. This is where the integration is setup and configured. If you see those items, you can proceed with registering the integration. If you don’t see the Integration Management item or the BambooHR Integration option, contact your time keeping provider for assistance. With Integration Management enabled on your account, you can proceed with registration and configuration. Please note, the employee integration must be setup and run before you can configure the time off integration or SSO link. 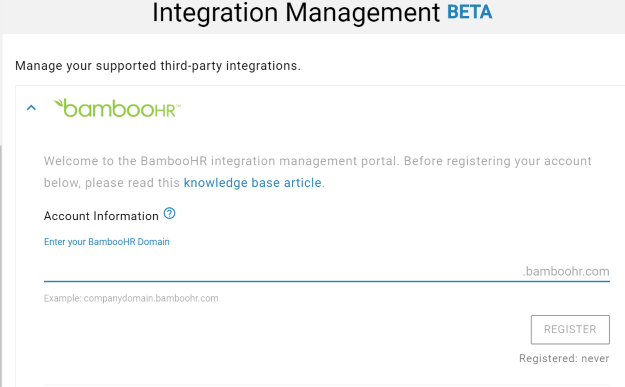 The integration cannot be setup with anything other than a BambooHR Administrative login and password. If you are logged into BambooHR at the time of setup with anything other than an Admin credential, the integration will not work. 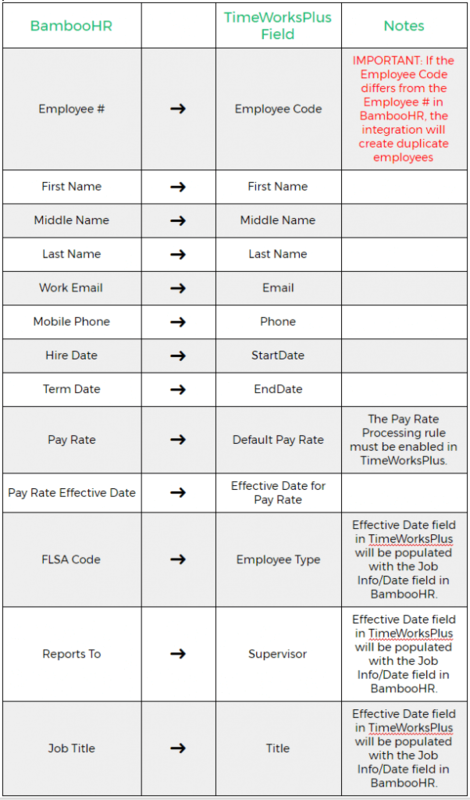 Make sure all the employee data in BambooHR is entered as you want it to appear in timekeeping. All employees in BambooHR must have an Employee # in order to be passed to TimeWorksPlus. For a list of the employee data that passes from BambooHR to TimeWorksPlus, see the section titled Integrated Employee Data. If you are a new user of BambooHR and current user of TimeWorksplus, please read the section Integrating BambooHR with an Active TimeWorksPlus Account before clicking registering the integration. If you are currently logged into BambooHR, it is best to log out. Login to TimeWorksPlus, click Settings Menu > Integration Management. Enter your BambooHR Domain in the field picture above. You cannot register the integration without the domain. Click the Register button. A pop-up will advise you to logout of BambooHR and read the corresponding knowledge base article for more information. If you do not see this pop-up, make sure your browser isn’t blocking pop-ups. If the connection is successful, you will be prompted for your BambooHR Admin credentials. DO NOT USE ANYTHING OTHER THAN ADMIN CREDENTIALS FOR THIS STEP.If the credentials are accepted, you can continue to step 5, otherwise, check that your domain and credentials are accurate and click Register Again. If successful, the page will display the time and date of the registration. The button will say Register Again. 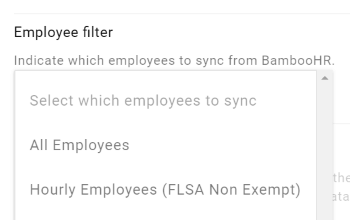 If you only want to sync hourly employees from BambooHR, use the Employee Filter drop-down to choose that group. Otherwise, you can select All Employees or a Custom group, if you have had one configured. Turn on the Employee Sync with the slider at the right of the page and click the Begin Sync button. It can take up to 5 minutes for the employee data to populate in TimeWorksPlus. Once the sync begins, Employee Setup will populate with employee data from BambooHR. Employees can start using the clock once they are given a clock number/login in TimeWorksPlus. With the Employee Sync is turned on, employee data will be updated every few minutes. From timekeeping, click Settings Menu > Integration Management to access the BambooHR configuration page. If you have just finished running the Employee Sync, you will already be on this page. At the bottom of the page, look for the Custom SSO Link and copy that URL using the Copy Link button. Do not use the URL shown in the image. Login to BambooHR as an admin. Mouse-over the Company Links (located in the sidebar) and select Manage. Click Add Category and name the category “SwipeClock”. Click Save. Click Add Link. Name the link “Employee Self Service Portal” and copy the URL from step 2 into the space provided. Click Save. The link will now be visible to employees in their BambooHR portal. TimeWorksPlus can import time off requests from BambooHR through our integration. 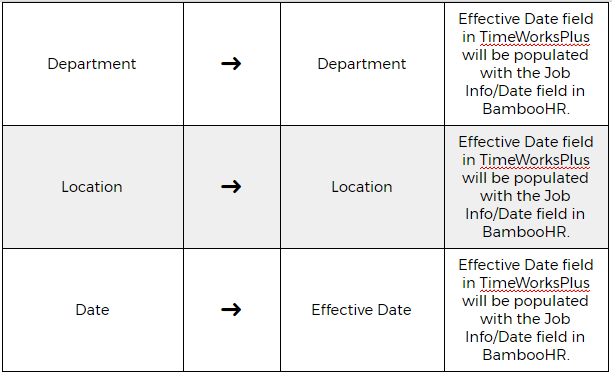 This means that time off requests submitted and approved in BambooHR can appear on the time card in TimeWorksPlus. This eliminates the need to re-enter requests on the time card. Manually enter approved requests and accrual balances in BambooHR. Manage the data in both systems. This option is not recommended as it can complicate the process. 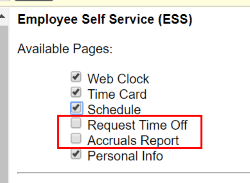 Time Off Requests and the Accruals Report should eventually be turned off in TimeWorksPlus. Otherwise, employees may still submit time off requests through TimeWorksPlus when they should be using BambooHR. You may need to contact your time keeping provider for assistance with this matter. Before setting up the Time Off Sync, you should have already setup and run the Employee Sync at least once. 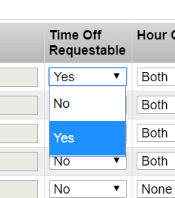 Time Off Requestable in TimeWorksPlus. Also, the TimeWorksPlus Punch Categories that correspond to the BambooHR time off categories, must be set to Time Off Requestable. You may need to contact your time keeping provider for assistance with this step. 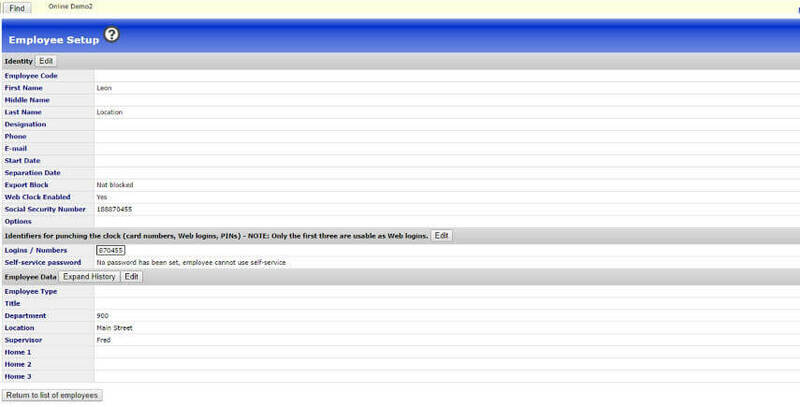 From within TimeWorksPlus, select Settings Menu > Integration Management. If you have just finished running the Employee Sync, you will already be on this page. Turn on the Request Time Off Sync. Click the Manual Sync for an initial import of approved time off from BambooHR. Once enabled, the integration will run automatically every few minutes. However, you can always return to this page to run the integration manually. What Data Syncs between BambooHR and SwipeClock? Currently, the fields that sync between BambooHR and SwipeClock are listed in the screenshot above. Each field in BambooHR is listed along with its corresponding field within SwipeClock. How do I View an Employee in SwipeClock? To view the employees within SwipeClock, log into your SwipeClock account directly and click on “Employee Setup” from the left-hand column. Then, click on the name of an employee to view their information in more detail. You can then fill out any additional details within the SwipeClock interface. Where do I go for Support for this Integration? For support for this integration please visit our knowledge base.